Spring is finally, really truly here and so are my allergies. This is the cruel irony of spring, it’s so beautiful outside but after an hour run my eyes are itchy and watery and my sinus’s are starting to make my head hurt. What’s a health conscious, outdoor loving Berkshireite to do? Well the good news is that there are a whole bunch of natural remedies to choose from. Everything from homeopathic remedies that you can purchase at the Health Food store on North Street to local bee pollen and honey by the tablespoonful. Bee pollen, nettles and Dana’s allergy tincture have been working really well for me this year but I wanted to have more options to share with my clients. I started doing some research and the list of natural, effective allergy remedies is so long, I started to get overwhelmed! Then I got an email from one of my health coaching clients, we have been working on a number of things together and during our last conversation, her seasonal allergies came up. Her email included an amazing ‘recipe’ she had found for delicious and effective allergy relief along with her account of how well it works! Before we get to the recipe, let’s make sure we are on the same page as far as what allergies are and why our bodies react the way they do. The most basic definition of an allergic reaction is that it is an inappropriate response by the body’s immune system to a substance that is not normally harmful, in this case, pollen. Pollens, molds, animal hairs, dust and foods all contain protein antigens that stimulate an antibody response or sometimes a “hyper-response.” Histamine and other chemicals are released into the system, causing an inflammatory reaction. This is called an antigen-antibody response. This reaction could affect the tissues, organs, the skin, mucous membranes, the lungs and gastrointestinal tract. Over the counter and prescription medication may alleviate your symptoms but they will never help build up your immune system. Worse, instead of helping your allergies lesson over time, your body will build a resistance to the medication and you will need larger and larger doses. That sounds unhealthy and expensive! The case for natural remedies is easy to make: they boost your body’s immune system while training it to react less and less over time to exposure to pollen. 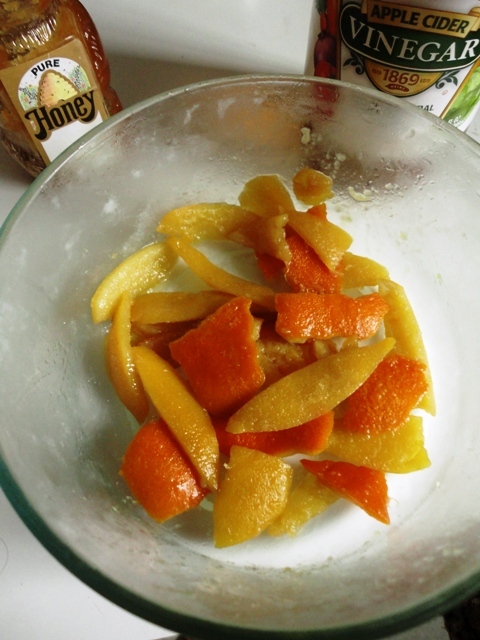 Colleen’s Allergy Recipe is for citrus peels in apple cider vinegar and local honey. This remedy is so effective because the citrus peels work as a natural antihistamine, which provides allergy relief within minutes, and the Vitamin C supports your immune system. The local honey is an equally important component because when you put a small amount of the seemingly harmful irritant (honey from local flower pollens) into your body, your immune system builds defenses or immunities against the foreign substance. This will make your immune system ready to handle that substance in larger quantities the next time you are exposed. It is a similar concept to using a vaccine or taking homeopathic medicine. Get honey as close as possible to where you live, this way it will be more likely to contain pollen from the plants that are causing your allergies. And, lastly, the apple cider vinegar, is there any malady that it isn’t good for? Those of you who have tried our Fire Cider know what I’m talking about! Just one more thing, when you make Colleen’s Allergy Remedy, be sure to use only organic citrus peels. Conventional citrus fruits are regularly sprayed with all sorts of toxic chemicals which are readily absorbed by the peel. Allergy relief you can eat. Thank you Colleen for the great picture! First, peel your fruit and soak the organic citrus peels, I used lemon and orange, in raw, organic apple cider vinegar for a few hours, mixing them every so often to make sure they get really soaked. Drain peels from the cider. Use the left over apple cider vinegar in your next salad dressing. Then, using local honey, in a pan over low heat simmer the peels with honey drizzled over them for about 45 minutes. Make sure the peels are completely soaked in the honey, the amount will vary depending on how many peels you are making at a time. Pour everything into a glass container and let it cool on the counter. Any honey not stuck to the peels can be eaten separately or added to licorice, mate or kukicha tea which are also great for allergy support. The peels and honey will keep in the refrigerator for up to two weeks. Colleen added that she found relief from watery, itchy eyes and a runny nose from eating 5 or 6 peel pieces followed by a glass of water. Fifteen minutes later her sinuses dried up, eyes stopped itching, throat wasn’t scratchy and her glands even reduced a little in size. Foods are powerful medicine, eat well and be well! Butterbur: this European herb shows great promise as a natural treatment for allergies. In a study published in the British Medical Journal, taking one tablet of butterbur four times a day was effective in controlling hay fever symptoms without the usual drowsiness accompanying many traditional antihistamines. Butterbur has been used medicinally since ancient Greece. Chrysanthemum: taken both as a salve and tea, the flower pods of this herb provide relief from red eyes, itchiness, and sinus pressure headaches associated with allergies. Steep the dried flower pods in boiling water for 1 minute, then let sit for 5-10 min, strain, and drink the tea. Place the boiled flower pods inside a paper towel and apply directly over the eyes for 10 minutes for relief from itchy, watery, red eyes associated with seasonal allergies. HEPA Filter: a High Efficiency Particulate Filter can filter out the tiniest particles floating in the air, including pollen grains. Use one in your bedroom, or other rooms where you tend to spend a lot of time indoors, and it will help relieve allergy symptoms by reducing your exposure to the allergens. A HEPA filter is a great idea to have in any bedroom to improve the quality of indoor air. Hope you find these additional suggestions useful as you seek to reduce your allergy symptoms. Here’s to no sneezing, coughing, watery eyes, or itchy eyes and nose!